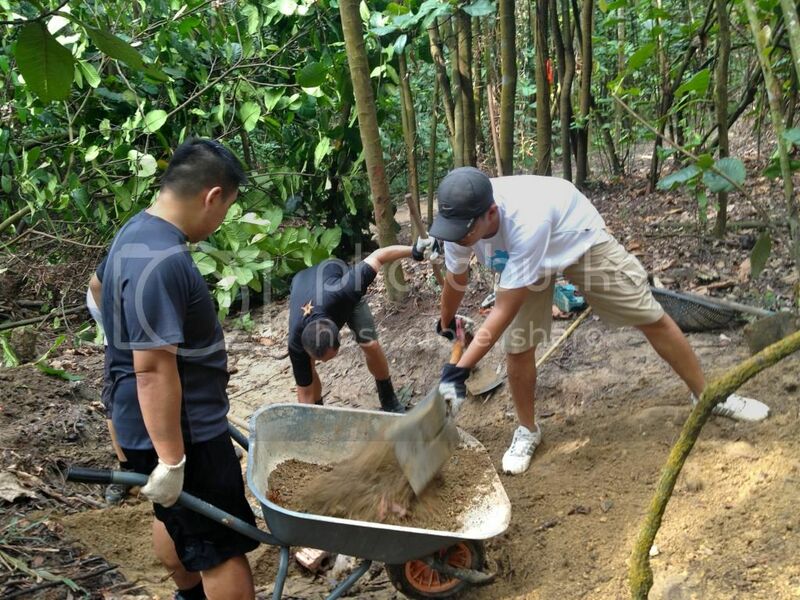 Singapore Trail Adoption Program (TAP) was initiated by MTB veteran Jeff Ng with support from National Park to allow mountain biking groups to take ownership of the trails. The objectives are to maintain sustainable trails, educate users and provide feedback to stakeholders. 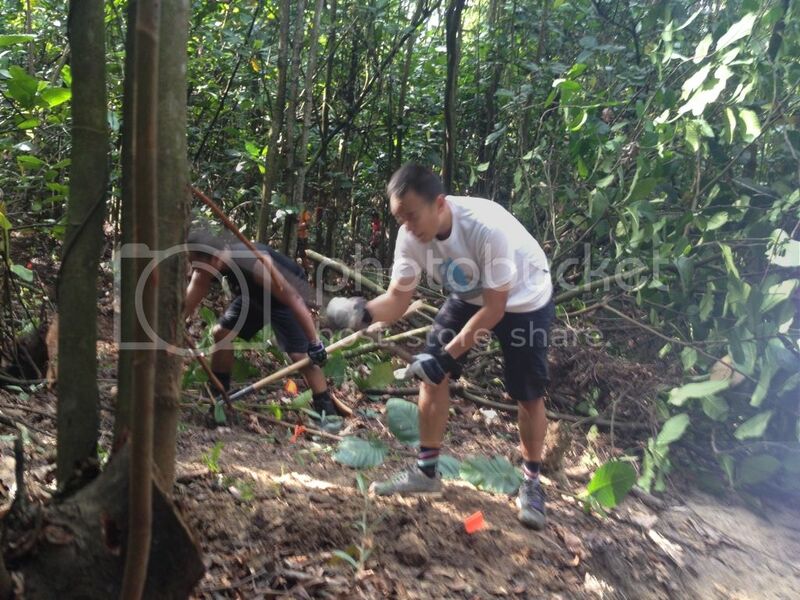 HM Lim, an expert in trail building volunteered as adviser to ensure trails are built in a sustainable manner. 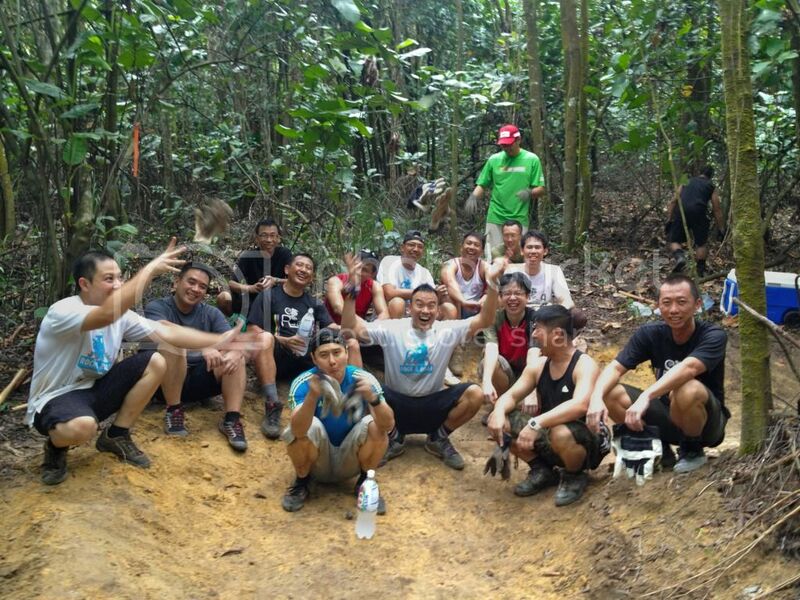 With the formation of Mountain Bike Association of Singapore (MBASG) in 2013, it is natural to synergize TAP with MBASG so that the new entity can better serve the mountain biking community in Singapore. 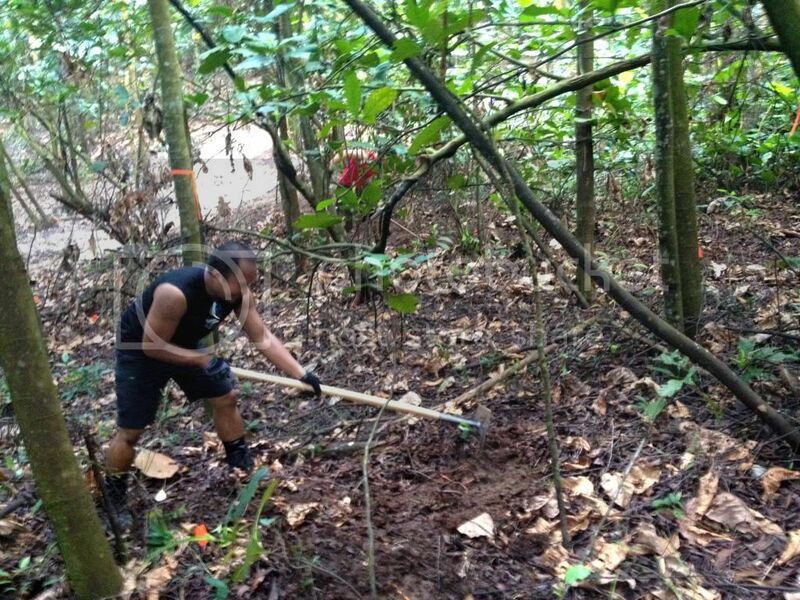 Currently, some of the trails are adopted by the following mountain biking groups, namely: (i) Kent Ridge Mounain Biking Trail by Ride Brothers & ACS(I); (ii) Zhenghua Mini Bike Park by Tropikaza; and (iii) Gangsa Hill by Se7en. 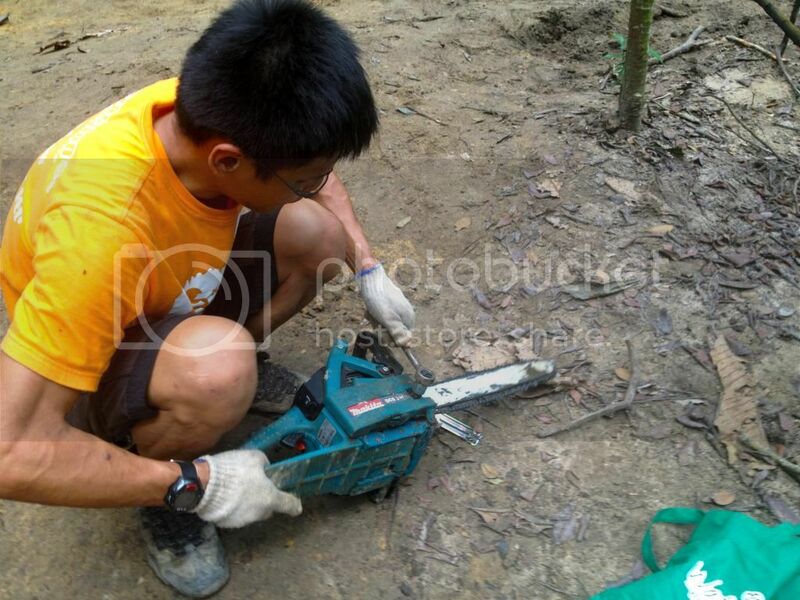 The intention of this article is to share with readers the experiences gained and thoughts for getting involved in Singapore trail work. 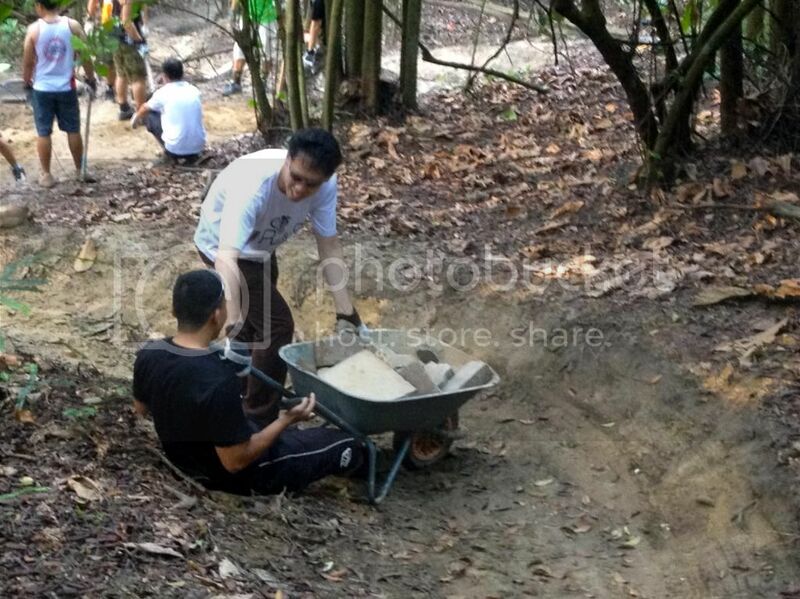 On 9th March 2013, biking group Rock and Rolla volunteered to do trail work at Kent Ridge Bike Park. 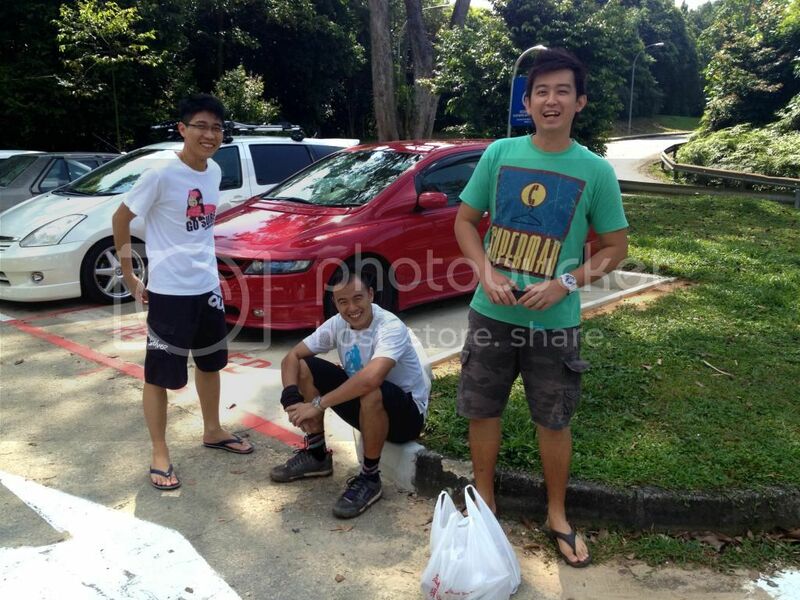 The initial plan was to get 6 volunteers but Calvin (Chief of RnR Rider Group) managed to mobilize 15 members. 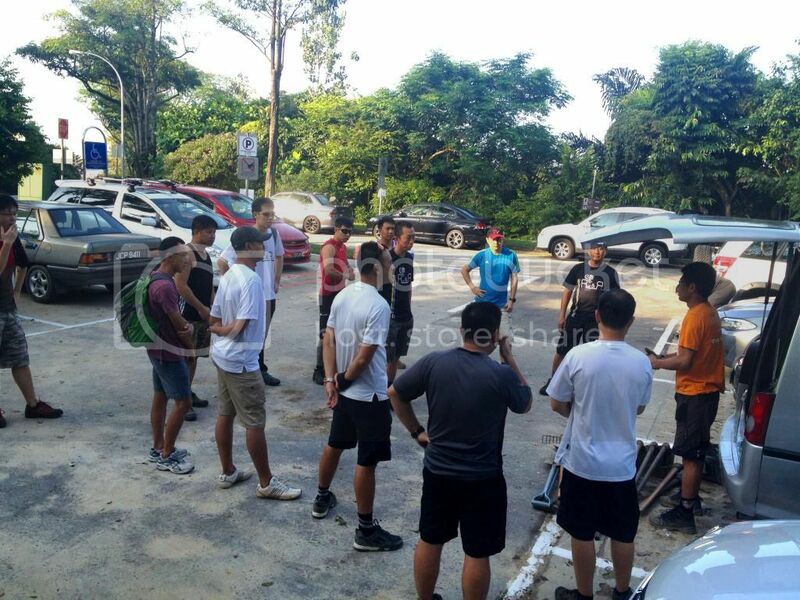 After a quick breakfast at 97 Pasir Panjang Road, the team were briefed by HM Lim on the safety aspect of trail building. These are the essential tools used for the trail work. 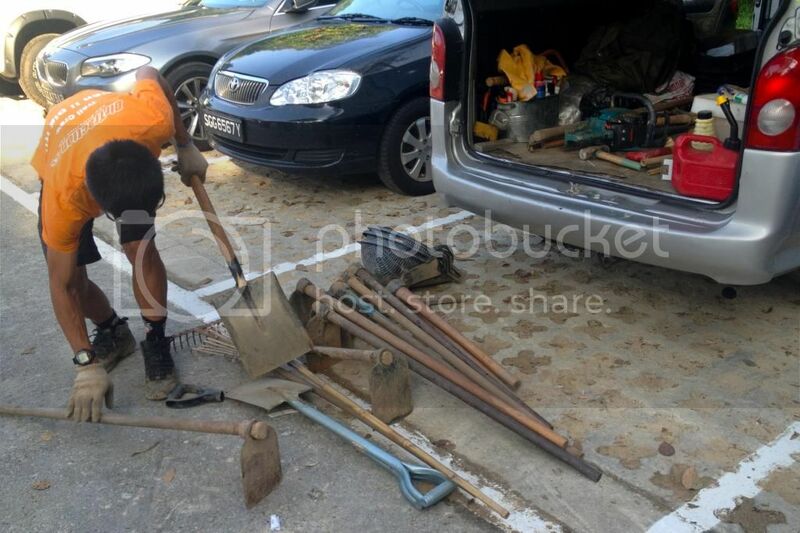 Thanks HM Lim and Jeff for supplying all these tools. 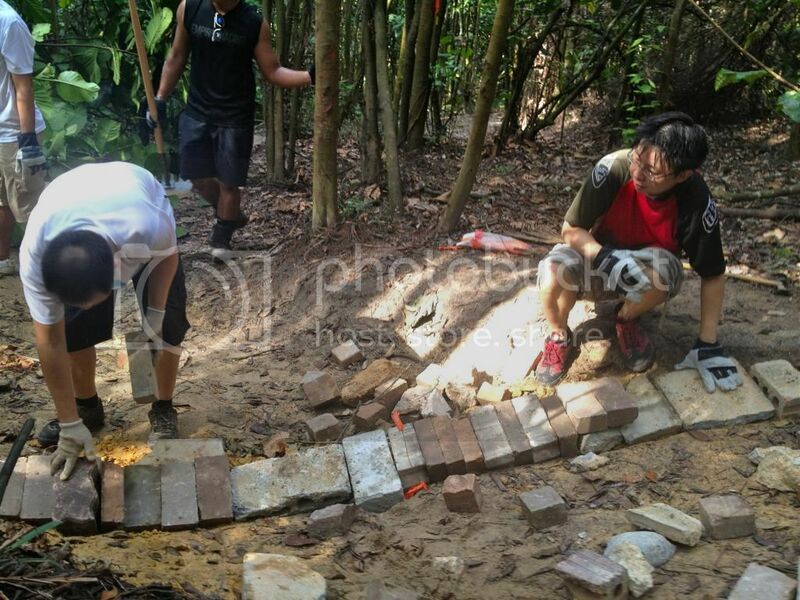 For a start, one team was assigned to carry rocks from the entrance of the trail to the trail work section about 500m away, while another team was assigned to construct the trails. Trust me, it is not easy to push full-loaded wheelbarrow along the tracks. These people looks like farmers, as the strokes were orchestrated in a coordinate manner! 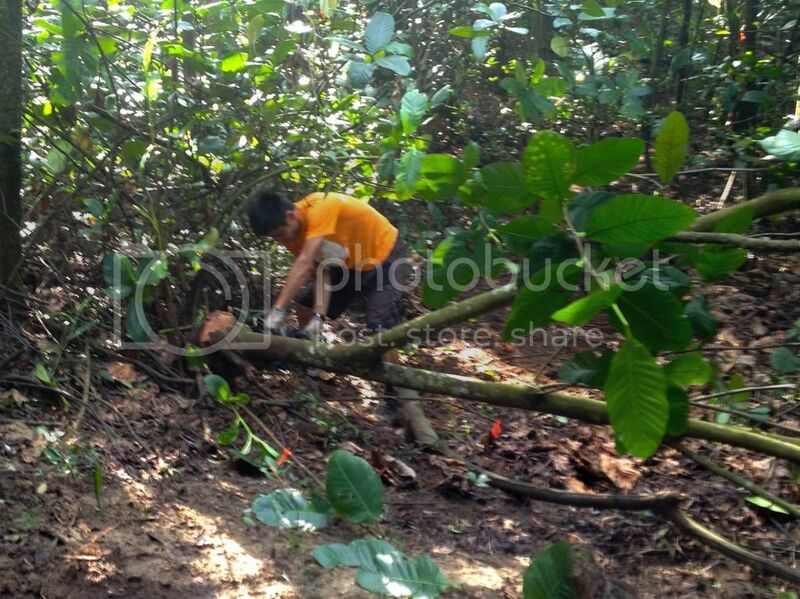 Working hard to clear the section for 3rd berm to be constructed later. 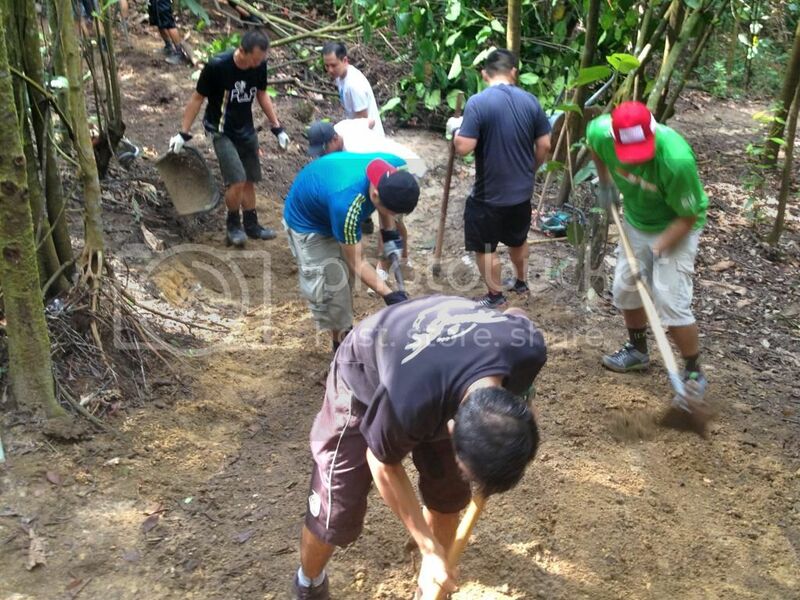 Lots of rocks were need to construct a small drop along the 2nd berm. The intention is to divert water away from the tracks. 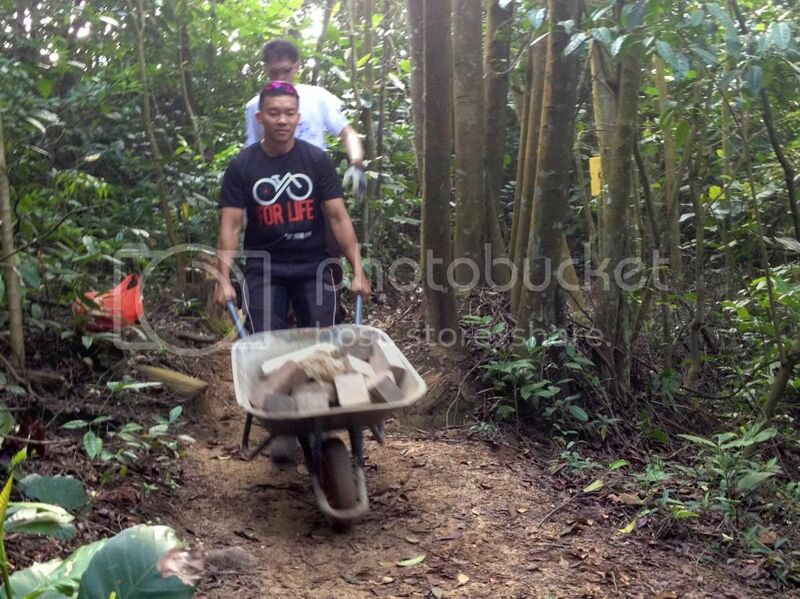 Even our top rider Chie Hui collapsed under the load of rocks! Chie Hui was rushing to attend a wedding after the trial work. Wonder if he went back to change. This is where the rocks were used. Vinz and Gerald showed us how the drop was built. It helps to divert rain water away from the trails. 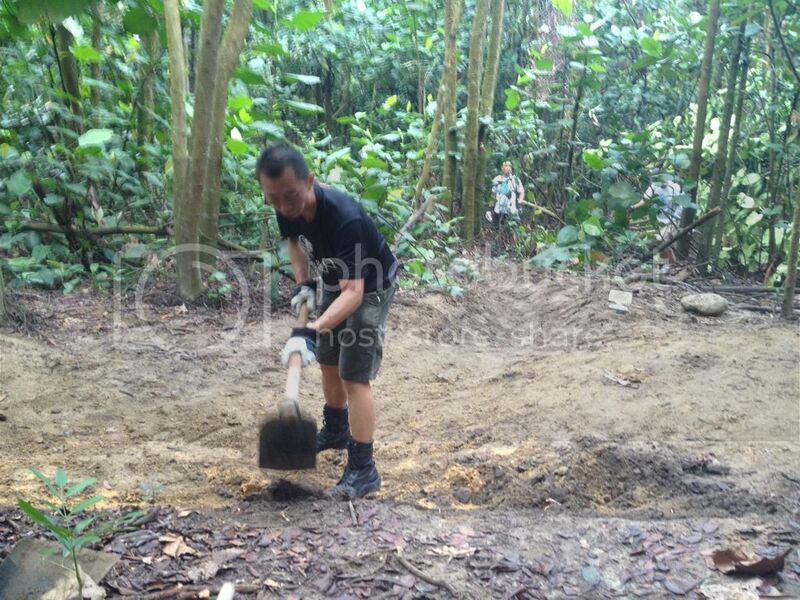 HM Lim showing us the right way to dig and construct the berm. Importance of team work. One group loosen the soil and creating the gradient, while Max attempted to compact the creation into permanent contour. Sorry, this need to go. We were thankful to these two gentlemen for fumigating the forest, and save us from mosquitoes attack! 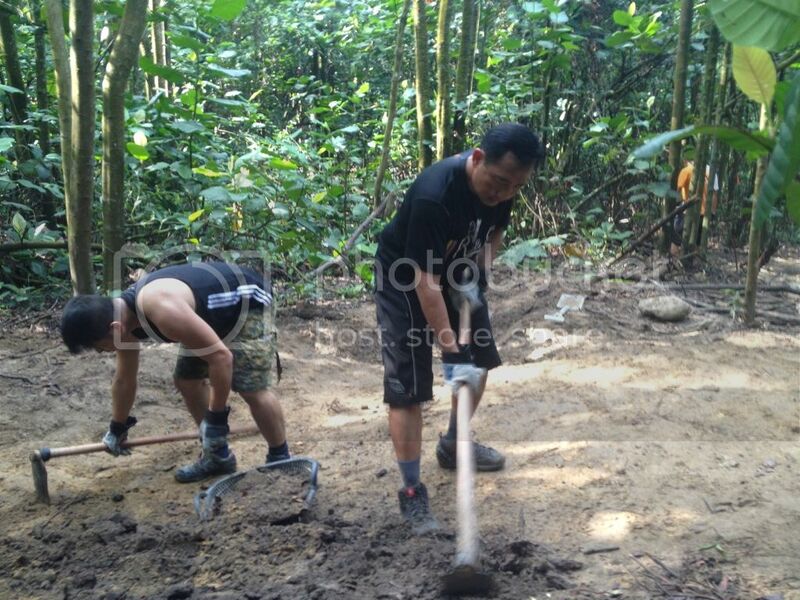 HM Lim, "Gentlemen, you guys were digging holes for ponding. Watch me, this is the right way to do..."
Raymond thought, "Tell me earlier mah! Dug for nothing..."
Transferring of soil from one section to another. Taking a break to demonstrate what we could do besides just digging! 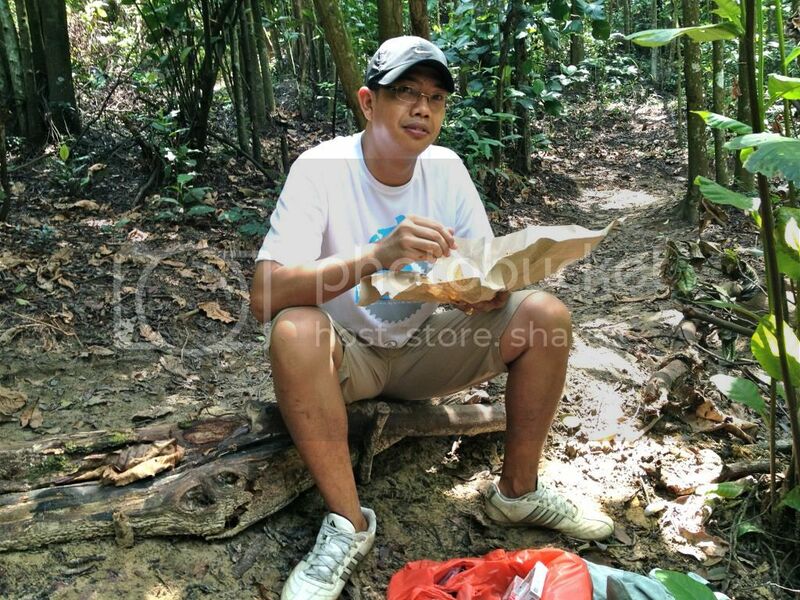 Thanks Ian Ong for buying yummy lasi-lemak for us! Also thanks him for sponsoring us two big cartoon of 100Plus energy drinks. We seriously needed that!!! Well deserving food after a day of hard work. Need some TLC, overworked the chainsaw. After the break, Calvin was trying to remove the pile of debris and soil that were obstructing the rainwater from flowing down the slope. Our kungfu master Keet! Damn hardworking and efficient. Kowtow to President! 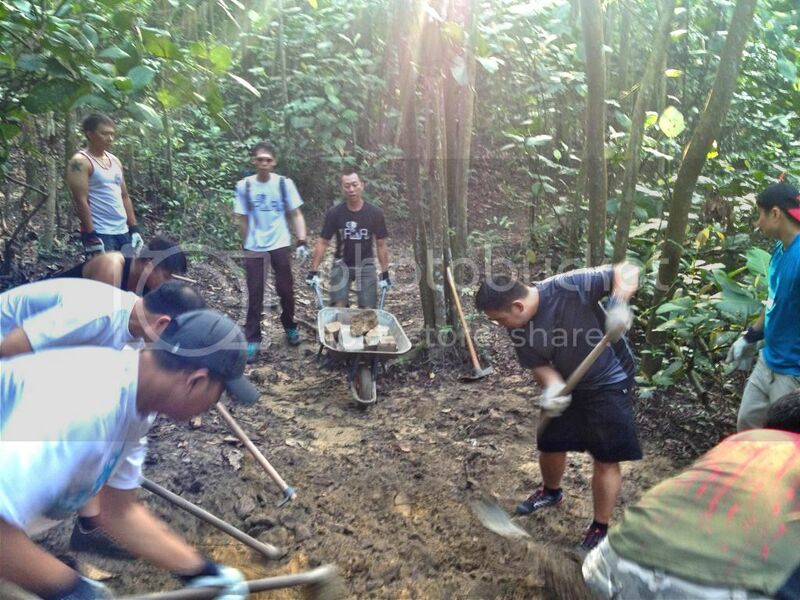 (Photo by Jeff Ng) This is the 2nd berm constructed by RnR team. Awesome! 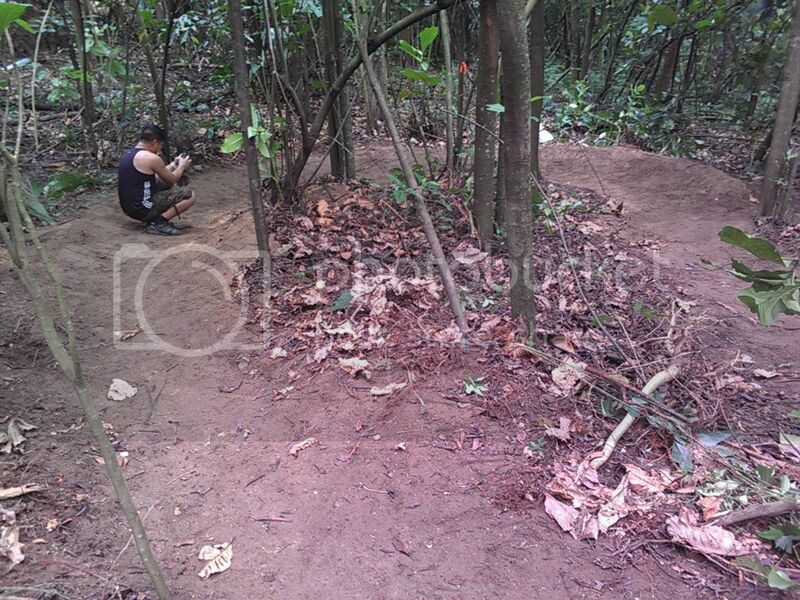 (Photo by Jeff Ng) 2nd berm shot from another angle of view. 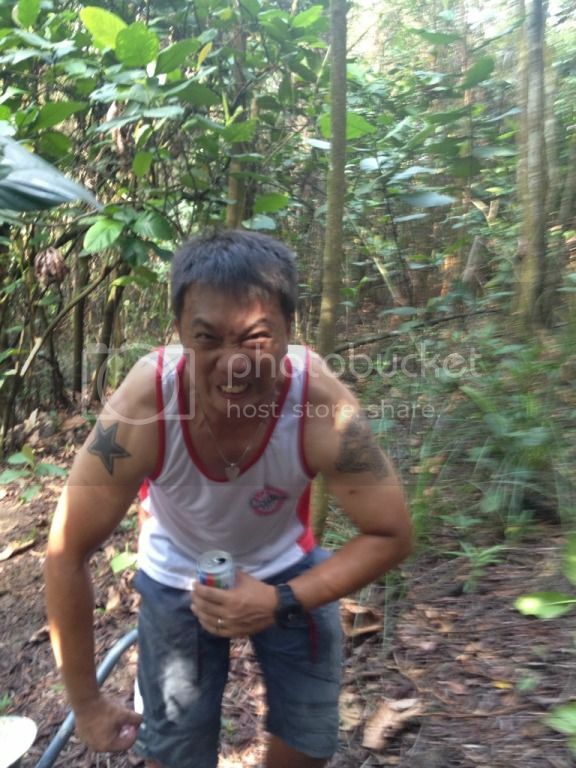 Captured a caveman in the wood! 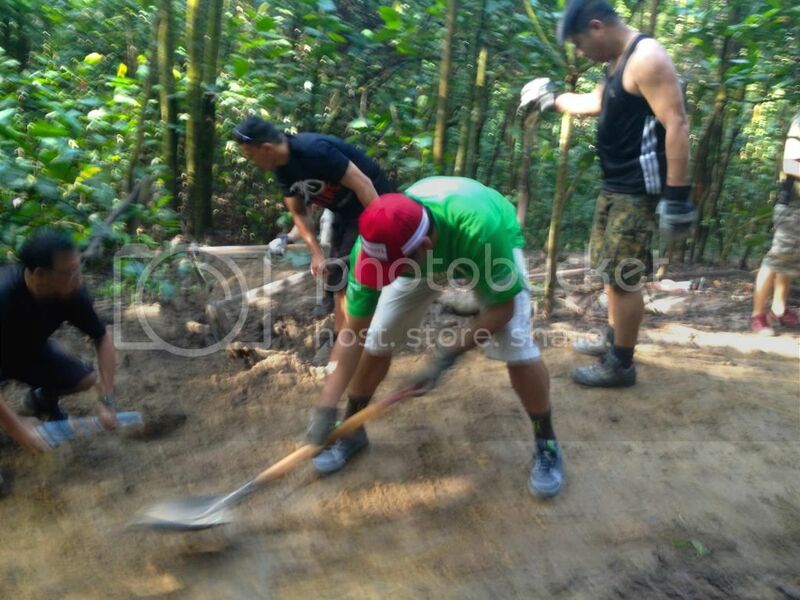 With the help of 20 riders and under supervision of HM Lim, we managed to construct 2 berms and a small drop within half a day. Not too bad for a team of 15 riders. 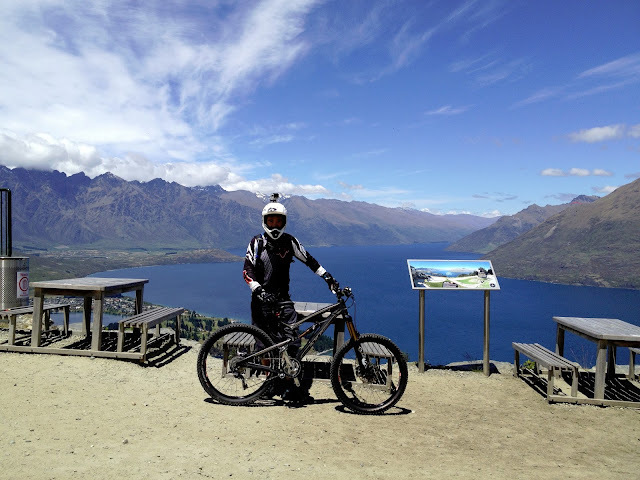 Although trail building could be done more efficiently with the right machineries, getting riders to hand build the trails will cultivate a sense of ownership and appreciation of the trails. Trails that are built in a sustainable manner can last a long time without much maintenance. 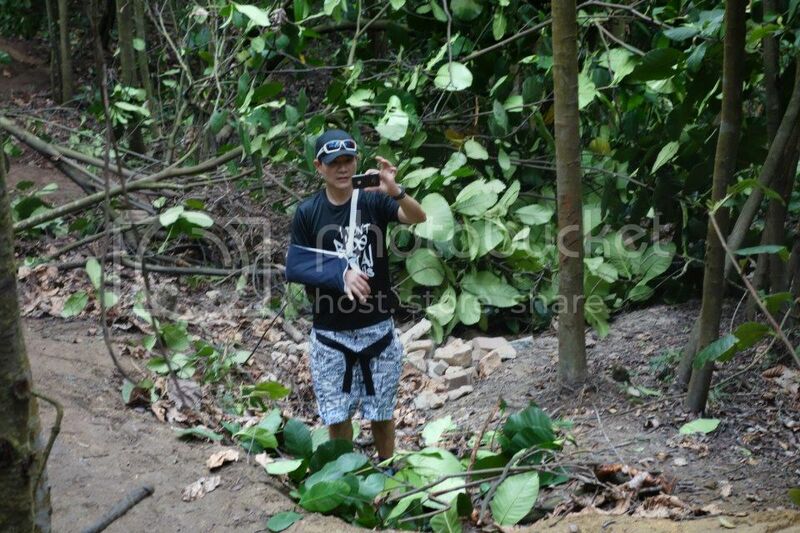 Illegally build trails without due consideration not only destroy the environment but poses hazard to users as well. 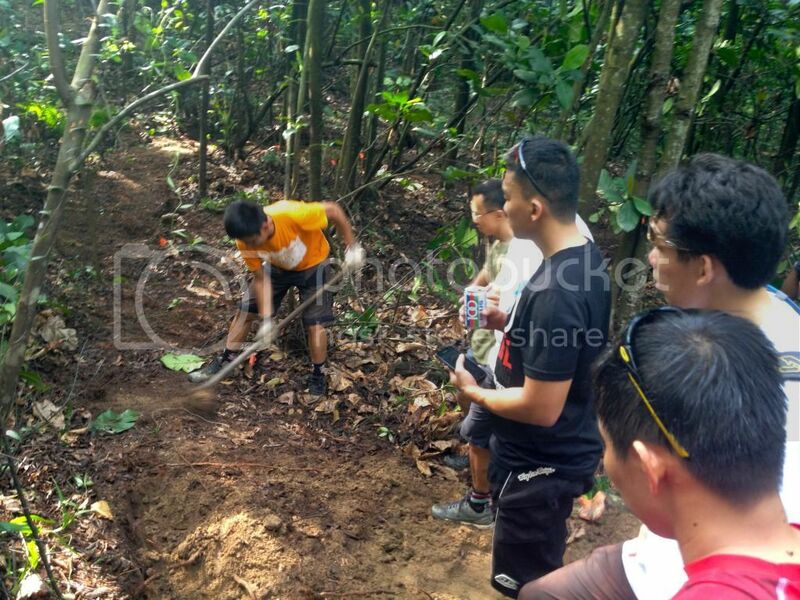 Hopefully, with the right education and involvement, we are able to protect, improve and expand our trail networks in Singapore!